Recently, I was sitting at the front window café bar of Iowa City’s Z’Marik’s Noodle Café on Dubuque Street eating my krith-a-raki for lunch when I decided to conduct a little experiment. For 15 minutes or so, I kept track of how many people walked past on my side of the street and how many on the other side. Nearly twice as many people walked by Z’Marik’s’ storefront than traversed the sidewalk on the east side of Dubuque. Acknowledging that this “study” is entirely anecdotal and unscientific, I nevertheless found my results telling (and not surprising). While I kept track of only the tiniest sliver of time, I believe the pattern would hold generally. Why is this so—and why is this important? Because I believe it tells us something about granularity. “Granularity” is a term used in urban planning to describe the level of small detail—how “fine-grained” (or not) something is in the city landscape. Most often, “granularity” refers to the size of blocks and the number of lots on a block. The smaller the block size and the more lots on a block, the more granularity exists. In an Oct. 21, 2015 article on the website Strong Towns, Andrew Price folds in the issue of ownership—the more individual lots that exist on a city block, the greater likelihood for diverse ownership. Finer granularity also provides more destinations within walking distance, encouraging the “walkability” that many communities strive for. Mentioned less often is aesthetics, which is something I’d like to fold into the conversation. Let’s hone back in on Iowa City. 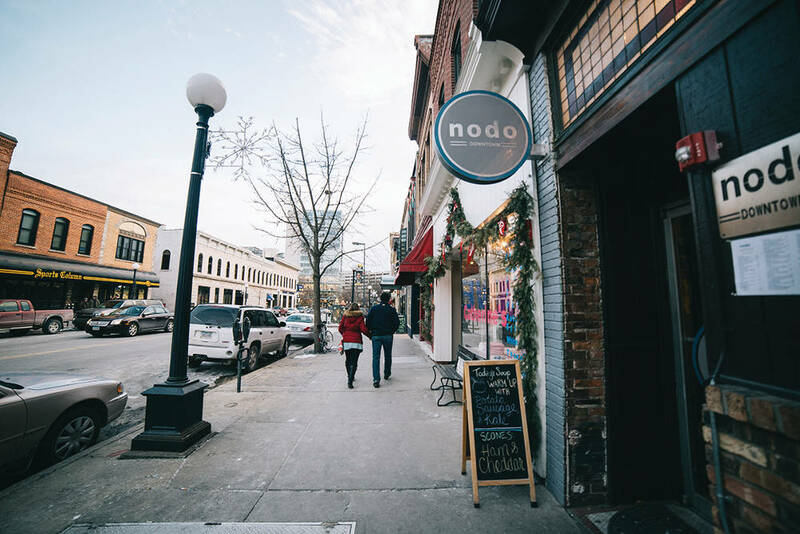 Our community—in both its official and unofficial voices—invokes the word “walkability” fairly frequently to describe both our perceived (but debatable) reality and our aspirations. In scouring city documents—the comprehensive plan, requests for proposals (RFPs) for city projects, etc.—I find little that specifies what “walkability” exactly means to city leaders aside from trail connections and, by implication, the support of a complete streets program. As our city more clearly defines its vision of walkability (which I hope it does), I imagine the concept’s typical components will apply: closeness of everyday destinations (businesses, schools, workplaces, parks, public spaces), access to public transit, proximity to a diversity of people, safe street design and so forth. I would advocate adding granularity into the mix—more, and more interesting, places to walk by and to. Put simply, regardless of how well-connected trails are and how technically safe a walking route is, people are more attracted to walking in fine-grained environments. Which brings me back to South Dubuque Street. In the 10-block, the west side of the street boasts nine distinct storefronts (10 if you include the Dublin Underground entrance), as well as the side wall of a business on each corner. Across the street, only four distinct businesses front the street. On the west side, each storefront is unique, and a number still boast some original architecture, which tends to be more detailed and thus fine-grained in and of itself. Across the street, an entire half-block is consumed by the flat gray expansion of U.S. Bank’s side wall—the original building plus at least two now-obscured additional buildings. On the other side of the alley in the middle of the block, a sports bar engulfs three separate buildings. Granted, both the bank and sports bar have mostly maintained the façades of the original second floors of the separate buildings, but at street level—eye level—there is little evidence that individual businesses and storefronts existed. (Regarding the bank, the same applies on Washington Street, where the bank has expanded eastward into additional storefronts, including the former Astro/Varsity/Garden Theater, the loss of which I wrote about in this column in 2011). Personally, even if I’m just passing through and have no destination on that block, I will intentionally choose the west over the east side of the South Dubuque 10-block to walk on. It is simply more interesting and aesthetically pleasing to do so. When the choice comes down to a half-block-long wall of gray concrete plus a quarter-block-long sports bar, or a variety of windows, entrances, businesses and architecture, I’ll choose the latter every time. And apparently my “walkability preference” is not uncommon, as my brief Z’Marik’s survey suggested. I am not suggesting that there should be no large buildings downtown. A healthy and vibrant central business district and a healthy community include a variety of buildings and styles. Yet granularity seems to be a low priority in current Iowa City development goals, if it is considered at all. As well, harkening back to my recent columns on place-led governance and the enclosure of public spaces, Burke says that a “human scale city” comes out of a “community-led process … That is, change is driven by a group of individual human beings with names and connections to their physical surroundings and built environment, not solely by trends in the real estate market, zoning laws or large city agencies.” This also reminds us that “placemaking is a process, not an outcome.” The building itself is not as important as how it was created and, after construction, how people interact with it as community members in a living city, including as pedestrians. Once lost, granularity is difficult to recapture—though not impossible. Kudos, for example, to the owners of the Pancheros building on Clinton and Washington who, thanks in part to the city’s Building Change improvement program, a few years ago recreated the black stamped metal paneling and black trimmed wood paneling of the storefront’s historic occupant, Whetstone Pharmacy. Pancheros also uncovered and restored the boxed-in fluted cast iron column at the entrance that had been obscured for many years. Kudos as well to Revival: New/Used/Vintage Women’s Clothing Store on the Ped Mall for keeping their old storefront with large display windows and recessed entrance intact, and especially for maintaining the Art Deco façade of the old Soap Opera space they moved into next door. Revival’s expansion could have easily obliterated the uniqueness of that space, one of the most distinctive historic storefronts in all of downtown. Even when a storefront maintains a single occupant, we lose granularity (and heritage) when more fine-grained façades are replaced with a single pane of glass, as so often happens today. Some may consider what Price calls “faux-granularity” as a panacea in new developments. Faux-granularity is “when a large building is divided into many separate destinations at street level to get the impression of fine-grained urbanism.” Faux-granularity is better than nothing, and, in fact, it exists in some older buildings (I’m thinking of the northeast half of the 100-block of South Linn—Record Collector, White Rabbit, Baroncini Restaurant, etc.). But faux is always faux in principle, and it carries with it other inherent problems. As Price points out, with faux-granularity, we’re usually talking about a large building with a single owner, so the level of granularity, if any at all, is left to the discretion of that single property owner. Faux-granularity often falls very short of true granularity. Iowa City, for example, has faux-granularity written into its building code for multi-family residential buildings in the Central Planning District (CPD) and planned high density multi-family residential (PRM) zones, which include some modest requirements for bays, projections and recesses in building articulation, and, in the CPD, requirements for “modules that give the appearance of smaller, individual buildings” in the form of material variation, parapet heights, architectural details, window patterns, balconies and recesses. That sounds good, but, personally, while I think there are a few moderately successful newer buildings in our downtown and near-downtown areas, the majority of the construction falls far short of what a successfully granular development could be, even though it meets city code. Finding little to no aesthetic pleasure or inspiration in them, I have little desire to walk by most of these extended buildings with “fill-in-the-blank”—and repetitive—faux-granular detail. I am not begrudging a business’ success that allows it to expand nor, generally, a city’s and/or developer’s ambition to erect a significant building. 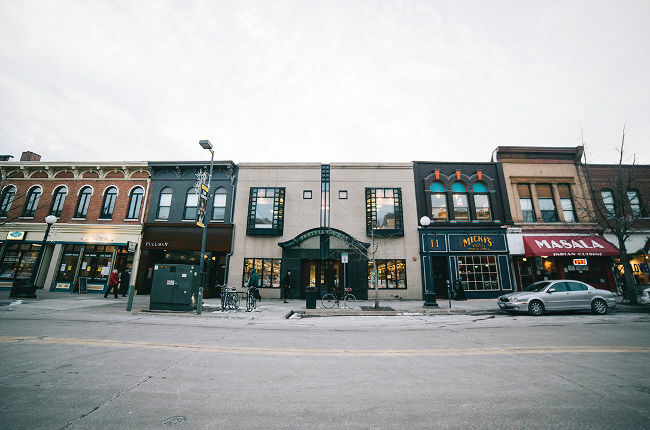 However, here in Iowa City, since the days of urban renewal up to the current projects on the docket for city-owned property, we have most often replaced fine-grained buildings with monumental single developments. I cannot recall the last time, if ever, the city sold off one of its properties as individual. The mega-development has reigned supreme. As well, the medium-scale buildings replacing old houses and small commercial buildings in the near-downtown core tend to merely conform to the city’s very low granularity bar. I believe that we should take granularity into account whenever inevitable changes come to our downtown streets. Yes, we can gain from a business expansion, a new building or a renovation of an older building, but we should also be cognizant of the significant losses we also experience. When we lose granularity—whether in architecture, number of walkable destinations, or economic diversity—we lose much. It would be wonderful to see granularity as an explicit value and policy in Iowa City’s future development efforts. I would appreciate being even more pleased and inspired by the human-scale development of the paths I traverse nearly every day. Thomas Dean thinks it’s important to see a world as grains of sand. This article was originally published in Little Village issue 193.